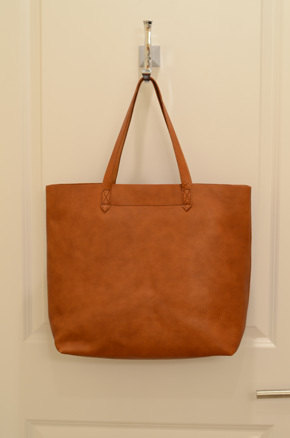 I had long obsessed over the Madewell Transport Tote in English Saddle after seeing it on fashion bloggers everywhere. When my awesome fiance bought it for me for Christmas this year, I was excited to start wearing it. Only…when I pulled the folded bag out of the box, I saw smooth, cheap, stiff, light-colored leather with really weird stress marks across the height of the bag. As I mentioned in a previous post, they reminded me of human skin stretch marks. So gross. Back it went. 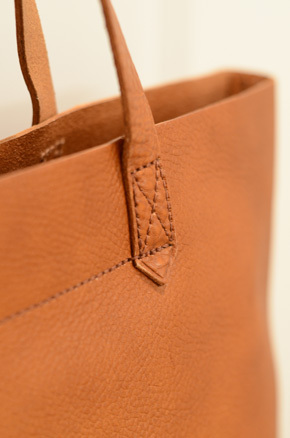 I then tried the Cuyana Leather Tote, and the color just wasn’t cognac enough. My fiance convinced me to take another shot on the Madewell bag. Maybe what we got was just a fluke? There were so many rave reviews, after all. The exchange arrived today. It came in a huge box whereas the first one came packed in a small, flat box. I pulled out a sealed plastic Madewell bag with this tote packed pristinely inside. Already promising! Then I saw the leather. It was immediately and obviously completely different from the first bag I received. This leather was saturated and a great cognac. It was also very pebbled with zero stretch, I mean stress, marks. The handles were also not dark — they were the same color as the rest of the bag. WTF? Must be a completely different batch? How could the quality be so inconsistent? Not to mention, I get that the first one was ordered during the holiday season but I can’t believe Madewell would ship me what was clearly a return, especially given how crappily it was packed and shipped. I wish I took a picture of the first bag for comparison, but I was so turned off I stuffed it back in the box and looked for the return label. Now, with this new bag, I feel like I won some bag lottery because I finally get all the raves about this bag. It’s gorgeous, the leather is the perfect amount of softness/stiffness, so that it’s supple but holds its structure, and the color is a perfect cognac. The leather isn’t super processed either — you can see the variations in color across the bag, so it adds a lot of character to the bag. Love it, love it, love it. Now I just want it monogrammed! If you’ve been eyeing this bag, take your shot at the lottery and see if you can score a gorgeous beauty here for just $168. Same here! I hate the inconsistent QC issues with madewell. I had to do several exchanges at different stores before finding one that’s perfect. I’m really late to the party in replying to this post, but I happened it across it as I was googling Cuyana, Madewell and Rib & Hull totes. Was the Madewell’s leather nicer than the Cuyana? I wasn’t sure how much I was diggin’ the pebbly look on the Cuyana and wanted to see what you thought about ‘floppiness’, etc. and just your overall impression of both of the bags. Don’t suppose you’ve seen a Rib & Hull in person, have you? Maybe you’ll still be reading this old post and let me know? Hi Joelle — so sorry for the late post! Haven’t had a chance to get back to this blog in a while. If you still haven’t made a decision yet, I’ll chime in with my two cents. Madewell’s leather is very inconsistent; I’ve seen ones that were VERY dry and stiff, with what I can only describe as ugly stretch marks. I’ve also seen ones that had really thick, gorgeous leather that were a darker shade than the dry ones. The differences were significant, so I’d recommend going to the store and asking them to bring out a few to choose from. When the Madewell bag was good, it was great — I liked it better than Cuyana because the color is much more saturated (vs the Cuyana bag I got seemed very flat in color, and light), and the Madewell leather was just the perfect amount of thickness/slouchiness, i.e. not too slouchy but not stiff. The Cuyana bag was very soft and wouldn’t stand on its own. It was pebbly but not in a cool, unique way. Still just kind of flat. At least IMO. Rib & Hull is very saturated in color but the texture is much smoother than both Cuyana and Madewell. The leather feels thick and very high quality. 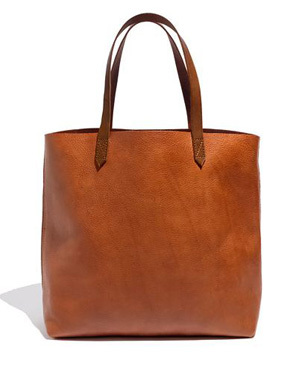 I like the simple style of the Madewell tote, which is why I’d choose it over the Rib & Hull, but I do believe overall the Rib & Hull is much higher quality than the Madewell. Hope I helped & many apologies again for the late reply! Thanks Natalie! Happy to have helped! 🙂 This bag is still one of my favs after all these months, so definitely worth taking the time to find the perfect one. Just hate that their quality is so inconsistent..
I’ve been eyeing this bag for a while and like you have said, there have been a lot of inconsistencies with the quality based on the reviews I’ve read. I actually want to get one with a monogram, but I am afraid that once I get it in the mail, I’ll end up not liking the quality of the bag and will not be able to return the product since it’s been personalized. It seems that you haven’t monogrammed yours yet and I was just wondering how you would go about doing so? Hi Angeli — Agree with you that it’d be a risk to order the bag monogrammed in case you get a bad apple. I think you can try just taking the bag (after you’ve chosen a good one) to the Madewell store and ask them if they can monogram it. I’ve heard of people who ordered theirs from a store and had it monogrammed then shipped to their house. Or contact Madewell online and inquire as to what they recommend if you already own the bag and would like it to be monogrammed post-sale. Hope I helped! Thanks for reading! I’ve been eying this bag for awhile and I’m glad to now have the advice to pick it out in the store — I didn’t realize there have been so many issues with consistency! I’m wondering how it is holding up almost a year later?? Thanks!